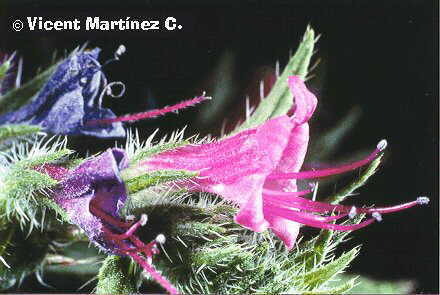 Echium vulgare – (Viper’ s bugloss): Biennial herb from the borage – boraginaceae- family very hairy, which may reach 90 cm tall. Basal leaves spear-shaped till 17 cm, stalked. Up leaves stalks absent. Red flowers which become blue, with 5 stamens, one of them remains inside the corolla. Dry calcareous places.